Nihat Zeybekci presents his proposed projects during a campaign program in İzmir, Feb. 7, 2019. Former economy minister and the current mayoral candidate of the People's Alliance for Izmir, Nihat Zeybekci said Izmir is not in the position it deserves in the national and international arena and he'll ensure the city is a prominent location in the world for trade, economy, industry, tourism, culture, gastronomy, health, transportation and desirable for foreign investors. Zeybekci gave an exclusive interview to Daily Sabah after a meeting on Thursday where he presented projects for Izmir Metropolitan Municipality. Stressing that Izmir has been attractive throughout history, he noted the city has an innate beauty with potential and natural features. "The legacy of this heritage is a culture of living together and democracy," he said. Underlining that his projects are not difficult to achieve, Zeybekci said they are rather easy, feasible, short, middle and long-term plans. "We listened to locals while preparing our projects. Thus, they focus on the peoples of Izmir," he added. Zeybekci was a former mayor of western Denizli province from 2004 to 2011 and served as economy minister twice: between 2013 and 2015, and 2016 to 2018. He had been working as an executive manager in the private sector prior to his career in politics, setting up his own firm in 1994, and acted as Denizli Platform speaker. Zeybekci also served as the chairman of the Denizli Textile and Ready-Made Garment Exporters Union. He also was the chairman of the Turkish Delegation to the European Council Local Governments Congress between 2004 and 2011 and deputy chairman of the Turkish Municipalities Union between 2005 and 2011. He was the chairman of the Turkish World Municipalities Union between 2009 and 2012. From the heart of trade and economy, Zeybekci remembers the Izmir of his childhood with the "Izmir Fair." Describing Izmir with the words Herodotus wrote about another Aegean city, Aydın, Zeybekci said Izmir is the most beautiful land under the heavens. Zeybekci, who will run against the candidate for the Republican People's Party (CHP), the Good Party (IP) and the Peoples' Democratic Party (HDP), Tunç Soyer, in the March 31 local elections, said the votes for the People's Alliance with the Nationalist Movement Party (MHP) in İzmir is trending. "We have embarked on a beautiful road with the People's Alliance. This is a union of fate," Zeybekci said and added that there is strong cooperation, particularly in İzmir. Stressing that they made a promise to Izmir, Zeybekci said with the People's Alliance's spirit of unity, the election campaign is advancing forward. The People's Alliance between the ruling Justice and Development Party (AK Party) and the MHP was formed ahead of the June 24 parliamentary and presidential elections. The alliance received a majority in Parliament, while their presidential candidate, incumbent President Recep Tayyip Erdoğan, won the election by 52.6 percent of the votes. As both parties consider the results of the June 24 elections as successful, they now seek to continue their alliance in the local elections. He also commented on the perception of Izmir as the stronghold of the CHP, a city where people have high expectations for change and transformation. "I can clearly say that Izmir is not a stronghold of some party; it is the stronghold of the people of Izmir. However, if we want to explain this city politically, we can see that Izmir has always favored the political right in the history of the city," he said. Izmir has been dubbed a CHP stronghold since the early 2000s when the party's mayors started governing the province. Pointing out that Izmir is not in the position it deserves in terms of the national and international arena, Zeybekci underscored that Izmir is a prominent city in the world with its trade, economy, industry, tourism, gastronomy, culture, health and transportation, and a city where loose ends are complemented. He added that he has a story for the city, and they will write this story altogether with the people of Izmir. Noting that cities from different countries are competing with each other rather than the countries themselves in today's world, Zeybekci highlighted that they striving for Izmir to compete in the Champions League of these cities, a place where the city belongs. Zeybekci stressed that he will transform the city into an international hot spot with his projects for the city. "Who would not want to come to such a city? Having completed economic, social and cultural infrastructure and superstructures and being integrated into the world will render this city the most desirable investment point for the investors," he added. Zeybekci indicated that the election campaign would be different from others by being conducted via social media and youth filled with enthusiasm, liveliness and vision for the future. Since they are not just using audiovisual and printed media, he said they are using every means to connect with voters quietly but effectively. "We are running an election campaign without causing sound pollution or wasting any paper or brochures and respecting the environment and nature. These are the things that are reciprocated in the field, and the things that our people missed," he added. Underlining the importance of voting for İzmir, Zeybekci said if people vote for what he emphasized, then they will vote for change, the future, better city life and for the Izmir we have all dreamed of. "I am from the Aegean and Izmir. I am a child of this land. In our campaign, we have always seen the benefits of this, and it has guided us," he added. Stressing that he has frequently met with the people of Izmir and listened to their problems, Zeybekci said they reached out to people with a 7/24 communication network and would return every message they receive. 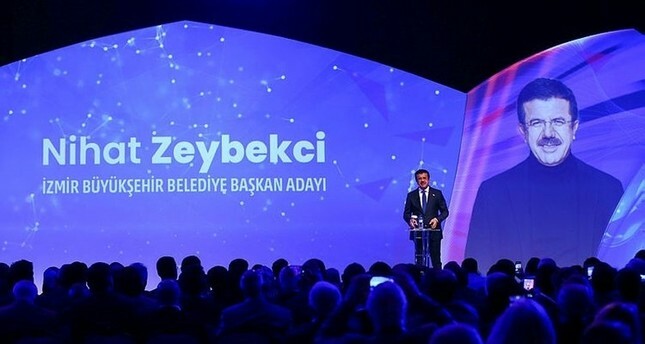 "We are doing what is not done in Izmir; we touch our people, we understand them and never cease our communication," Zeybekci noted, saying this comes through when they win the hearts of the people, and when they listen, understand and serve them. "When all these arguments come together, the beauty will come naturally."